Pros: Classy, classic, and great for integrating an open kitchen with the rest of your home. 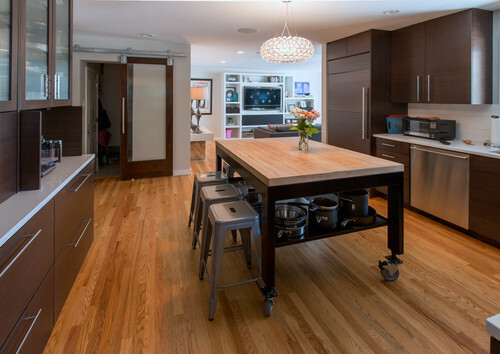 “To help blur the lines between the family room and the open kitchen area, utilize the same flooring material in both spaces,” says Carib Daniel Martin, principal of Carib Daniel Martin architecture+design in the Washington, DC, area. Try white oak or walnut. Cons: Did you see that price? Photo by LETTER FOUR, INC.
Pros: The epitome of simplicity, tile resists dirt and water and looks good doing it. Besides porcelain, you can choose ceramic, quarry, or marble options. Cons: It's expensive to install—and you’ll probably need a pro to do it right. Don’t like cold feet? You’ll want to add a radiant heating system to create a warm floor in the winter, suggests Martin. 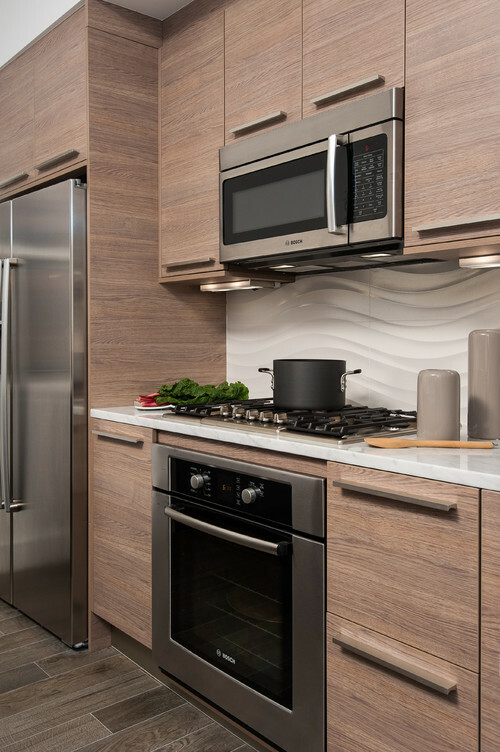 Pros: Laminate, which includes brands such as Formica, comes in a wide variety of colors and textures. It is scratch-resistant, withstands heavy sunlight, is easy to clean, and is quick to install, even for a DIYer. Cons: Have a worn area? Laminates can’t be sanded or refinished. You’ll have to replace it instead. Plus, while you may get laminate flooring that looks like wood, it’s not. 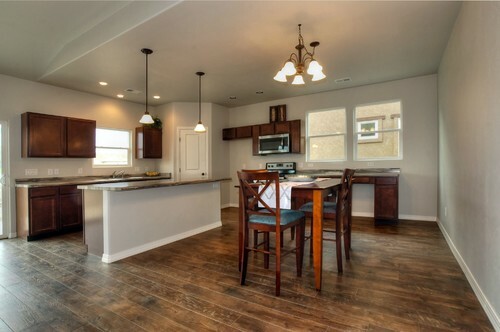 Not sure what flooring will fit your kitchen (and budget) best? Many online and brick-and-mortar stores have flooring samples. That way, “you can confirm the product matches the look and feel you’re going for,” says Tom Schnitzer, director of flooring at Wayfair. Once you've got your flooring covered, you need something to accent it. This is especially true if you've chosen a neutral or all-white kitchen. 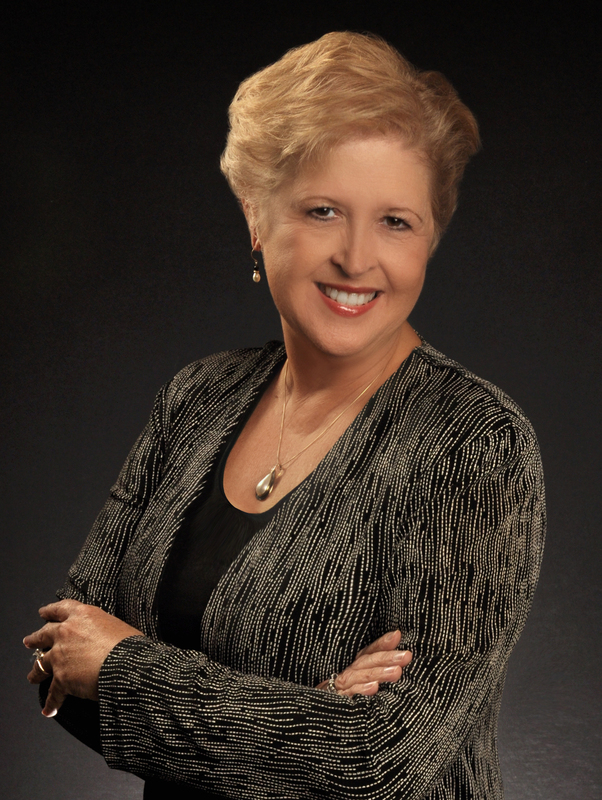 A rugcan "add a pop of color and intrigue,” says Schnitzer. Flat weaves are a good choice since they hold their own against foot traffic. For ease of cleaning, consider a cotton rug that you can toss into the washer when it starts looking grimy. You can also hand-wash a rugthat’s made of natural fibers such as bamboo or sisal. 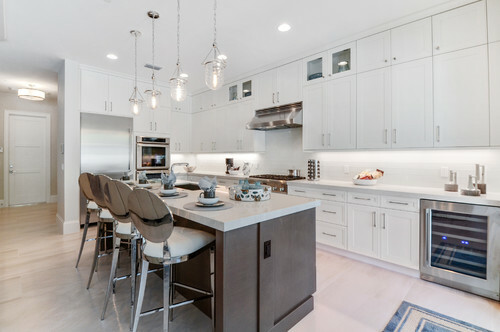 Under-cabinet lighting: LED strips or pucks won’t replace your main lighting, but they can help get rid of the shadows in your kitchen and give your space a warmer feel. 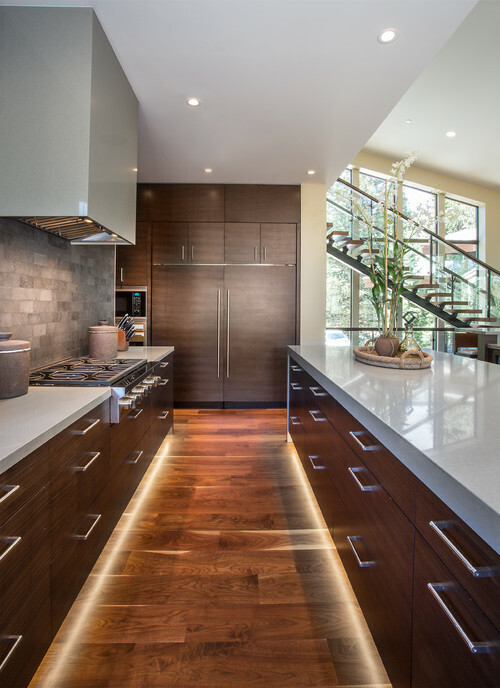 Toe-kick lighting: An LED strip beneath your bottom cabinets will add some stylish light to the perimeter of your kitchen. Plus, it’s a subtle way to provide some safety lights. 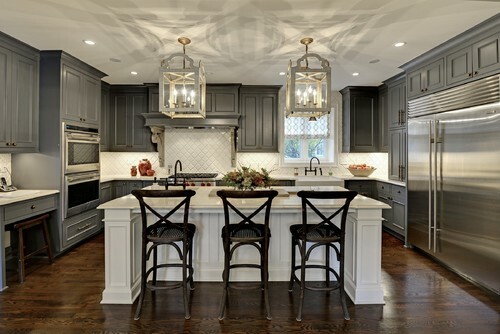 Pendant lighting: Available in a variety of shapes, these hanging lights are great over sinks and islands. Sconces: Traditional light fixtures affixed to the wall with a bracket, sconces can provide either task or ambient lighting. 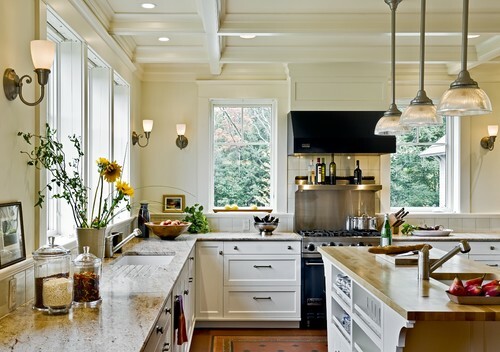 Don’t settle for counter material to fill that space between your counters and upper cabinets. Backsplashes are big! “The backsplash is where we have our opportunity to showcase our personalities a little bit," says Cummings. 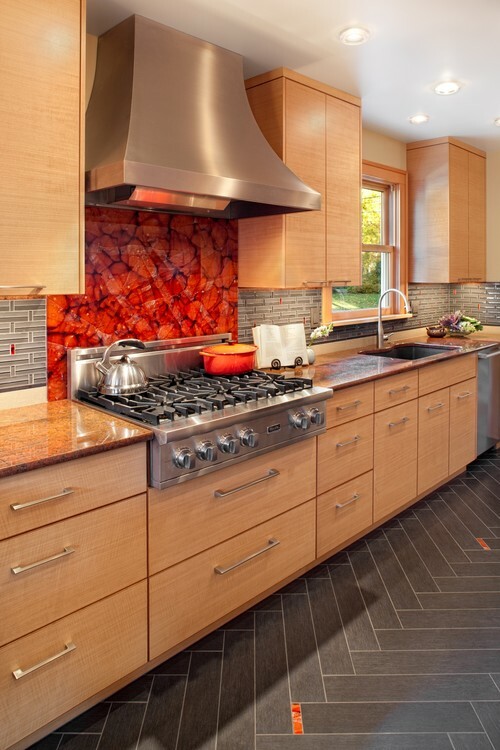 “There’s an entire universe of gorgeous backsplash tile out there." It's a small area that can have a big impact, be it 3D tiles or colorful patterns reminiscent of old Havana hotels. Brick’s obviously the natural choice for modern industrial-style kitchens. Photo by JDL Development Inc. Didn't opt for a built-in island? 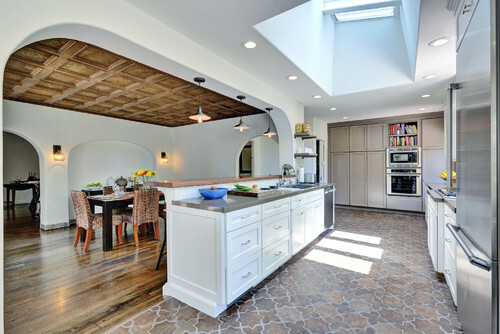 Rolling kitchen islands continue to be a hot trend. "What’s great about a rolling kitchen island is that they’re versatile pieces that can be used for cooking and storing and displaying dishware and decorative accents," says Schnitzer. "And since they have wheels, they can easily be moved around the kitchen or dining space." You’ll also need seating that goes beyond your kitchen table, be that a standalone chair, if room allows, or stools at your island, sideboard, or counter. “Eye-catching bar stools are an easy way to jazz up a kitchen and can be easily swapped to match the season or occasion,” Schnitzer says. 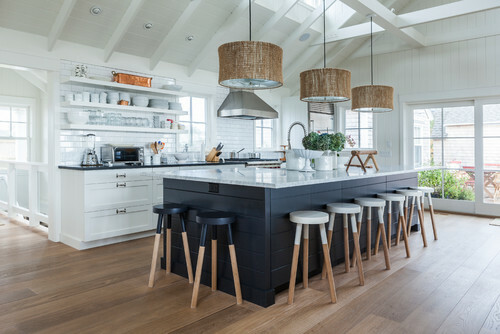 “If there is something that inspires the theme of your kitchen, take note of its colors and textures and try to incorporate that into the design,” suggests Cummings. Maybe it’s the color palette of your favorite dish pattern, or an inherited piece of art. 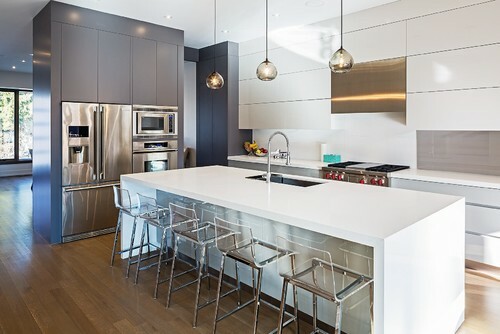 “Pay attention to the lines of the appliances and the knobs and switches on the range, as they’re all styled in different ways, from traditional to modern,” Cummings says.